The peak of the annual Geminid Meteor Shower is predicted to take place the night of Dec. 13, and it's a show you won't want to miss. Here's why it's special and how to catch it. 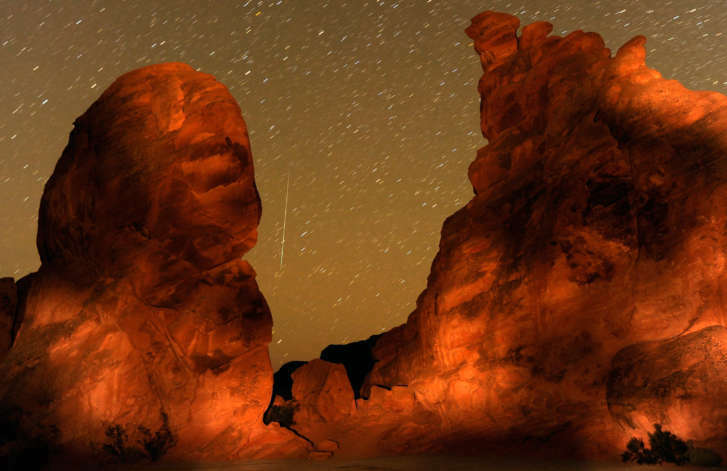 WASHINGTON — In our skies the night of Dec. 13, the peak of the annual Geminid Meteor Shower is predicted to take place. If the weather cooperates, this is a meteor shower worth getting out to see starting at about 10 p.m. EST all the way through dawn. I say worth the effort as I think the Geminids is the best meteor shower of the year, and I am not the only one who thinks so. I say best because it reliably produces a large number of meteors per hour (75-100) in a dark sky and many of them are bright enough to be classified as fireballs — a meteor that is brighter than the planet Venus. Plus, the Geminids is one of the major meteor showers where you can see a good number of meteors starting at 9 to 10 p.m. local time instead of the hours just before dawn — in other words, all night long. While the predicted peak of the 2017 Geminid Meteor Shower is overnight from Dec. 13 to 14, you can see Geminids from Dec. 12 to 16. Each year at this time, our planet encounters a debris stream of rock particles made by Asteroid 3200 Phaethon as it orbits the Sun. The Geminids is the only meteor shower caused by a rock comet — all others, except the Quadrantids (caused by an asteroid), are due to cometary debris. As Earth moves in its orbit around the Sun, it collides with this rocky debris stream and the particles hit our atmosphere at 22 miles per second to become “shooting or falling stars.” It is thought that the Geminds are brighter than other meteor showers because they involve larger and heavier debris than normal cometary dust and penetrate deeper into the atmosphere. The best place to see the Geminids is a location that is away from lights and obstructions such as trees and buildings. If you are a city dweller you still may see the brightest Geminids as long as you are not staring into a street light or nestled in amongst tall buildings. Out in the country or along the beach is the best place to be. And unlike last year’s Geminids, which had to compete with a supermoon’s bright light, this year the moon won’t be a major factor to spoil our view. You do not need any equipment or know how to enjoy this sky show. You just need to find a place where you can put a lounge chair or blanket to see as much of the sky as possible. If you have the time and inclination, start watching for Geminids at 8 p.m. by looking low in the east for the constellation Gemini for which this meteor shower is named. A meteor that is part of the shower can be traced back to Gemini. Sporadic meteors that are not part of the shower can be normally seen during the night as well. As Gemini rises higher and higher in the sky, more and more meteors should become visible. The shower will continue all night before dawn. The key to watching the shower is being comfortable, in other words WARM. The Geminids can appear anywhere in the sky but looking straight up gives you the widest viewing area — this is where the lounge chair or blanket comes in handy. Enjoy the shower with family, friends or your significant other. Some music, food and beverages are an added plus. The weather may cloud us out in the WTOP viewing area for this sky show. Our best bet is to check the sky to see if it is clear when you want to go out to look for Geminids. If it is cloudy, you can still observe the Geminid Meteor Shower. Experts from NASA’s Meteoroid Environment Office will be live on Facebook to discuss the Geminids and why meteors and meteoroids are important to NASA beginning at 9 p.m. EST on Dec. 12.